"Halloween books are hot commodities at the library this week," one parent said to me at my son's preschool. Many parents love to share scary, spooky, or silly Halloween books with their children this time of year. The kids are already amped up for the Halloween celebrations at school and the neighborhood Trick or Treat events. Reading a book before or after a celebration might make the experience that much more memorable. We read quite a few Halloween books this week in between the birthday celebrations for Ed Emberley, Crockett Johnson, and Steven Kellogg. 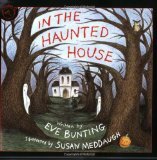 Five of the books were by Eve Bunting, whose birthday is December 19, and will be celebrated once again this year. The first book we read was The Banshee. This book is not technically a Halloween book, but it sure spooked my kids! As the legend goes the Banshee visits a home where someone will soon die. A young boy hears sounds coming from outside on windy night and believes the Banshee has possibly come for his ailing younger brother. He is brave and decides to confront the Banshee to protect his family. This book was beautifully illustrated by Emily Arnold McCully. We then read In the Haunted House. This book follows two sets of sneakers through many spooky rooms. The book is full of great rhymes and illustrations of your typical spooks found in a Halloween house. The best part is finding out who the sneakers belong to at the end. (Click Here to a YouTube adaptation of the book) After reading this book my daughter says, "So, what activity are we doing?" I guess she comes to expect an activity after celebrating authors for almost a year. Below is the activity I came up with per her request. 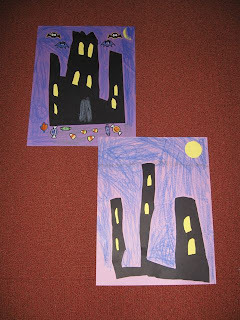 I had her draw a haunted house on black paper and cut it out. I told her to draw a few windows too. Then I cut out the windows out and then we taped yellow paper to the back to give them an eerie glow. After that, she pasted it on purple paper in which she colored and decorated with stickers. She wasn't satisfied with just one, so we made two. My son also took this book into preschool on the day the class was going to make their own spooky Halloween house out of a large cardboard box. At our house, I just had to use "Monster Spray" (aka Febreze Air Effects) under the bed, desk, and in the closet. I am sure I will spraying the rest of the week and into next with all the spooky energy at our house. Happy Halloween! 1. Brimful Curiosities - They have a bunch of Halloween posts up right now! We carved a Banshee in one of our pumpkins this year! Oh! I love the Halloween house projects! She did such a great job! I'm definitely keeping some of these on my list for next year's Halloween. Thanks too for including our review in the links! Such a fun book!